We've been dealing with chromatic approaches here lately and I ran across an interesting book on the topic a few weeks ago. The book is called Targeting and was written by a Denver trumpet player named Jason Klobnak. Jason uses the term targeting rather than approaches or enclosures because he takes a broader view of the concept. Jason defines targeting as aiming and moving at a goal note with purpose. In the beginning of his book Jason covers the more conventional chromatic approaches in the same way that I usually present the material to my own students. 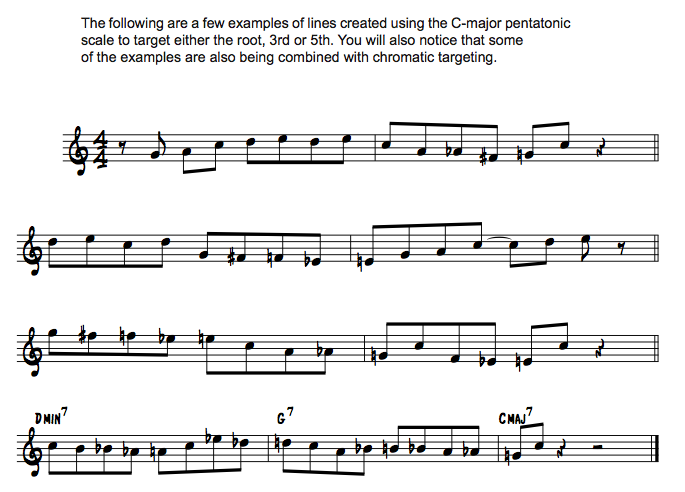 He explains the ten different ways that one can chromatically approach any given note- from a half-step to a minor third. I usually have my students practice approaching every chord tone (including #11, b9, #9, 13 and b13) using each one of these ten different chromatic approaches. I can't stress how important this one technique is. Once you really get these approaches under your fingers you can use them to create, not only great Bop lines, but you can also combine these approaches to create ultra-modern, super-hip, knock-grandma-off-her-rocker, snaky chromatic-banana lines. As long as you keep the forward motion going then your target can keep moving and your destination never has to come, like an acid trip that never seems to end...but enough of my wasted youth, let's get back to Jason's book. 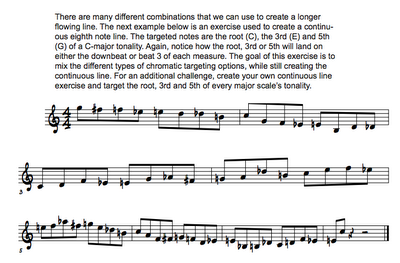 The final chapter puts everything together with some nice etudes. I am quite impressed with this book, such a crucial technique for Jazz students deserves a thorough and complete book like this one. 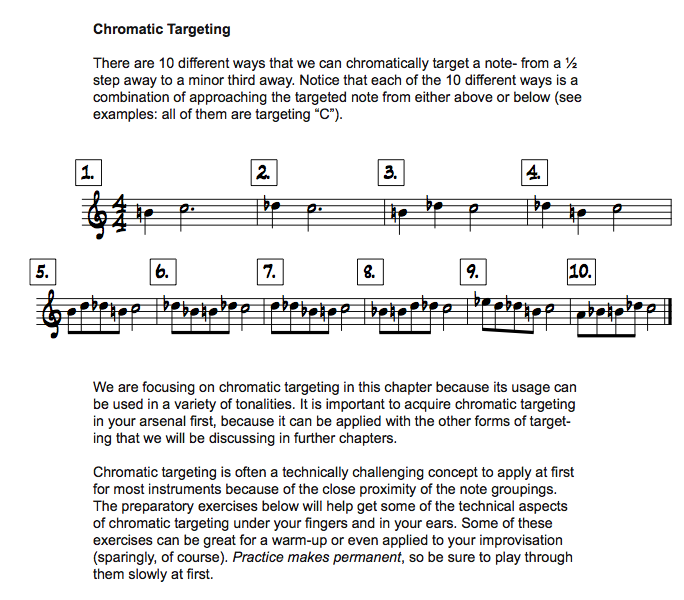 Nice post on chromatic approaches or targeting as Jason Klobnak calls it. However, I wonder if - and it's just a remark - but once you start including examples 9 & 10 (approaching from a minor 3rd away) you should really include approaches coming from a major 3rd, 4th etc. I took lessons with Charlie Banacos (which I think you did as well?) and so it reminds me of Charlie's methodical approach to the same system. Charlie also seemed to look at things from all angles, encouraging you to see other possibilities. 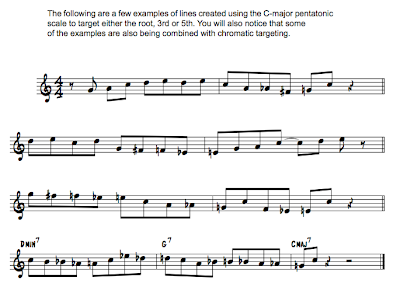 Of course if you do start on that path you get some extremely interesting stuff happening 'a la' Slonimsky. If you make a chart of that you end up with endless possibilities - 4th below/Semitone above, semitone below/4th above,2 semitones above/4th below etc .... the list is (not completely) endless. 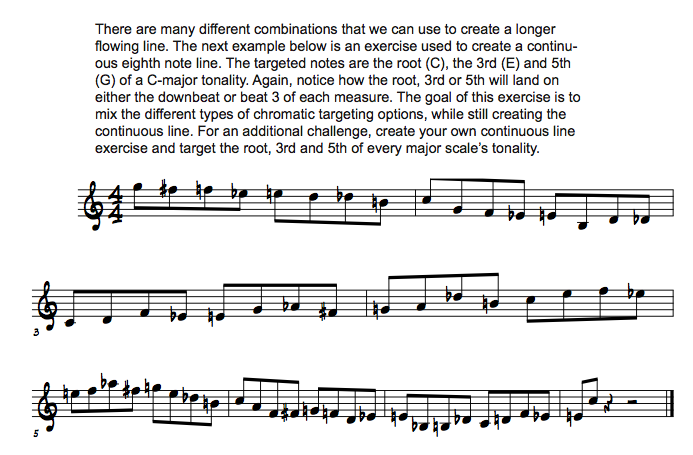 Add into that some rhythmic variations of triplets (or 5s, 6s etc) you can imagine the vastness of the idea. You just have to make them 'musical' and of course fit them into your music .... the difficult bit! Thanks for the post (as always). That would be a good next step certainly. I would like to see that idea expanded. How about a guest blogger spot for you? I never got the chance to study with Charlie, though I wish I had. If you're interested I can certainly write something on that - I imagine you're talking about the approach ideas? If it's Charlie (we're talking about) I could write something, although it's more about his ideas, not mine. I think you can see my email address so drop me an email and we can organise a fun guest post. I would love to have someone write about any of Charlie's ideas. I have been trying to get more insight into what exactly he was teaching. So it would be great if you wrote about his approach ideas or anything else that you feel like. There is not much information on his teaching method, even though he has had a major influence on modern Jazz harmony and improvisation. I know he had a very structured curriculum that covered a lot of Post-Bop harmonic concepts, like his three-tonic ideas. I'll come back with some ideas at a later point on Charlie. I only studied with him for 3 (+/-) years via correspondence until his death. He had a very 'methodical' approach to what he taught .... not unlike someone such as Matt Otto I suspect. I notice Jason Klobnak's approaches look not unlike a Banacos page. His ideas - the few that I learnt from him - were very methodical, not unlike looking at a Slonimsky book, but often 'be-bop' in nature. He also used to make people laugh with the names he gave to lines or ideas - ex :'Flemish Blemish' ... was one of his pentatonic scale ideas! Of course people studying with him personally must of had a very different story to tell as with correspondence you'd get a tape every lesson - I still have a few - and a sheet with the material. You'd work on it, record the results and send it back, etc. I should add that on the tapes he'd make all sorts of funny remarks and jokes as if you were chatting on the phone, so it was quite a personal experience really. I can of course write a little bit about his ideas but maybe you should contact Barbara (Banacos), who's still teaching his material, and ask her if she could do a mini post for you. Or is there someone out there reading this post that could enlighten us as to the 3 tonic idea (I didn't get that lesson)? I've heard a lot of great comments on Charlie Banacos' approach, but I haven't had the opportunity to check out any of his stuff. Like David said, I'd love to see or hear more about what he taught. 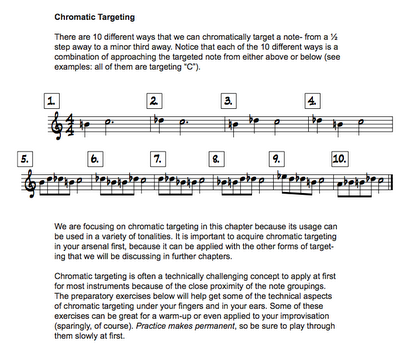 There's a number of different ways we could chromatically target (or approach/enclose) as you mentioned (i.e. 'a la' Slonimsky). There's actually one I've been playing lately that's based off of the chromatic targeting concept but inserting a minor third in between the chromatic grouping. Also...I'd like to thank David for the nice review! Firstly thanks for your article. It's always great to see how some people are very organised when practising ideas. I'm one of those who's completely disorganised, and I think my playing often shows it (LOL)! As I mentioned your page/system looks very organised, as Charlie's were also. I seem to remember reading - I think via a Tim Price piece - how Charlie really knew his Slonimsky, and that doesn't surprise me. From what you hear from other people Charlie had some really far out ideas. Unfortunately I didn't study long enough to get those, just the basic be-bop things, of which approach tones were basic study material. Here's the Tim Price link talking about Coltrane, Slonimsky and Charlie Banacos! In the meanwhile I'm going to look into what I could write about Charlie in connection with the approach/target system. Thanks again for the article (and of course the blog).